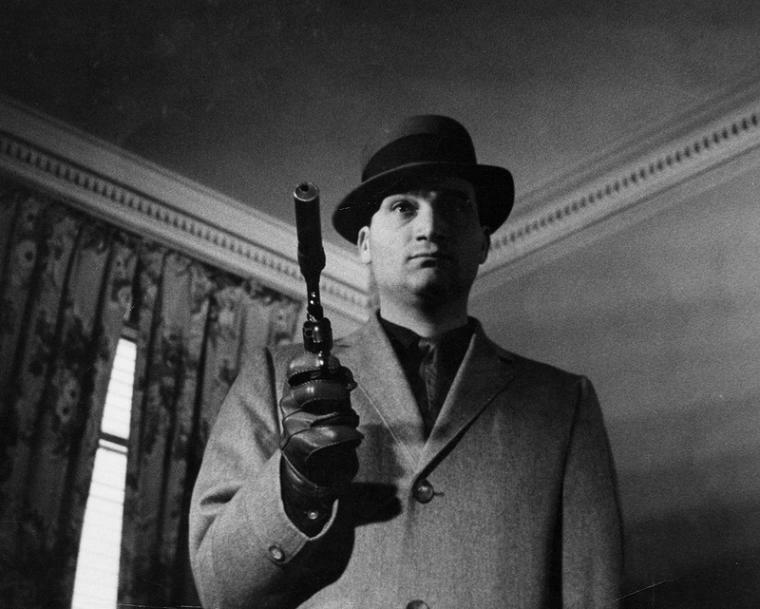 By the 1960s, Noir had run its course as a film genre. The legacy of film noir would carry on, to be sure, in such disparate films as The Godfather, A Better Tomorrow, and Pulp Fiction. But though these movies carry the mark of noir like a genetic imprint, they're not Noir in the strictest sense. Allen Baron's Blast of Silence was one of the last. Released in 1961, the film embodies all the Cold War era paranoia and alienation that was spreading like a pandemic fever in the U.S. Two of the filmmakers were blacklisted artists: the movie's narration was written by Waldo Salt under the pseudonym Mel Davenport and the narrator was Lionel Stander who wasn't even credited at the time. One could say that the film's existential angst was "built in" from its inception. The film suffers from its low-budget (approximately $20,000). Allen Baron was the writer, director, and star. The movie's producer was also the director of photography. As a result the acting comes off stiff and some of the second act seems convoluted as a result. The movie is also shorter than usual at 77 minutes. The film's aspect ratio (1.33:1), however, adds to the already constricted feel of the film and makes for palpable visual tension. The film's visual design is what elevates the film to "must see" status. The movie opens up in complete darkness but for a pinhole of light at the end of a tunnel. A woman in the throes of childbirth screams as we inch closer to the light, and Lionel Stander's well-graveled voice tells us that we are one Frank Bono out of Cleveland, born into pain. Frank Bono has come to New York to kill someone. He's an expert and this is just another business trip for him. If the opening sequence of this film doesn't grab you, then you might as well give up and stick to Romantic Comedies or Teen Movies. Blast of Silence is the quintessential style-over-substance genre movie. That's not to say that the plot or characters are completely substandard in any way, but they do take a back seat to the film's highly ambitious and provocative photography. When Frank is walking down a street, you get the sense that everybody else, even the ones walking in the same direction, is traveling in counterpoint to him. He's like a shark weaving through coral with the scent of blood hot on his nostrils. The fact that it's Christmas in New York only amplifies Frank's loneliness and our growing sense of alienation. A boys' choir sings a traditional Christmas hymn as Frank stalks his prey through the towering concrete forests. The effect is haunting. He's like a Bizarro Scrooge who looked into the eyes of Christmas Future and, instead of begging for another chance, spat in his face. I've seen some hard boiled eggs on the screen but this guy's 20 minutes.